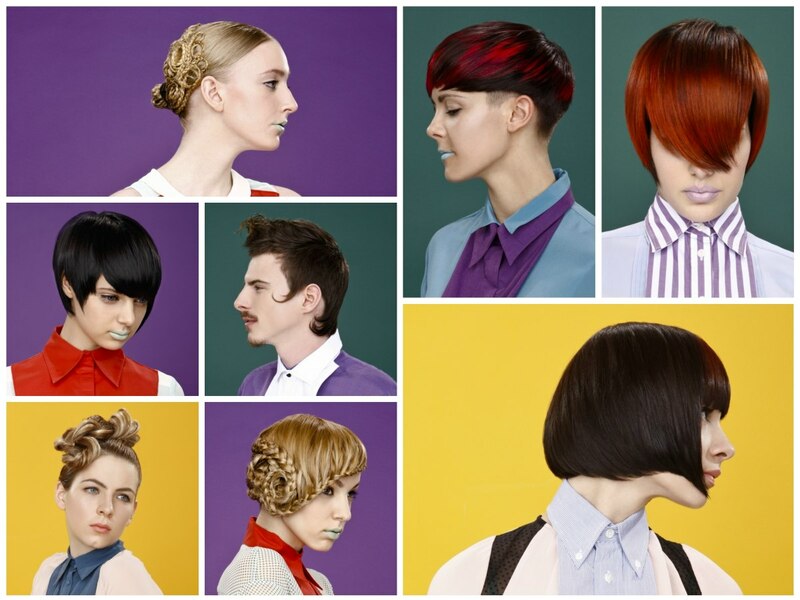 Out of Slovenia comes a collection of hairstyles that is young, fresh and so much fun. The joy that the stylists had when creating this colorful bunch of great looks resonates out of every strand and we look forward to seeing more from Mič Styling. The collection has two parts: a set of plays on the bob with distinct corners, curves, color effects and a unique interpretation of classic chic. The four other styles are spectacular excursions into fashion history and also to phantasy land, where our dreams are made. Influences are aplenty and the outcome is just beautifully elaborate, elegant, playful and hilarious with a charm that cannot be beat. This is retro without the dust. 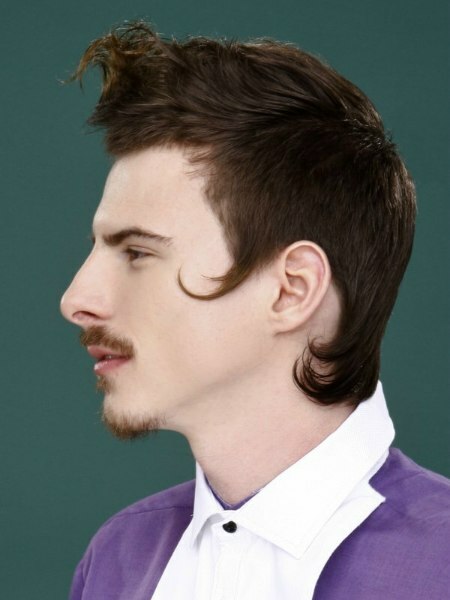 Reinterpreted braiding techniques and even a very dandy look for the men. Check out the clothes and make-up too! 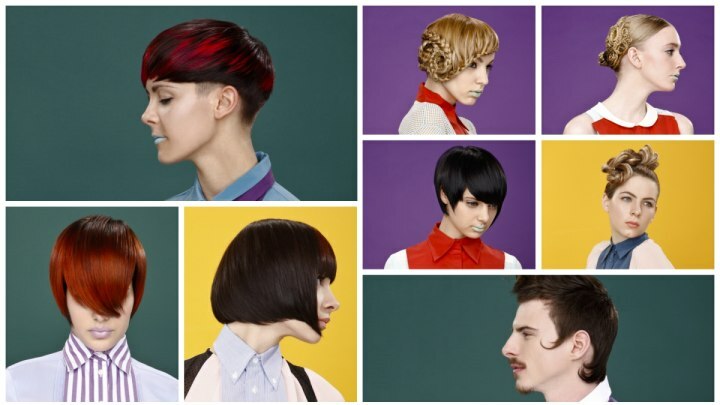 A very short mushroom or bowl cut just jumps out of the picture with the bold mix of hair colors and the composition of sleek and ultra short textures. Her base color is a deep brown onto which streaks of bright red and a rich fuchsia were set. 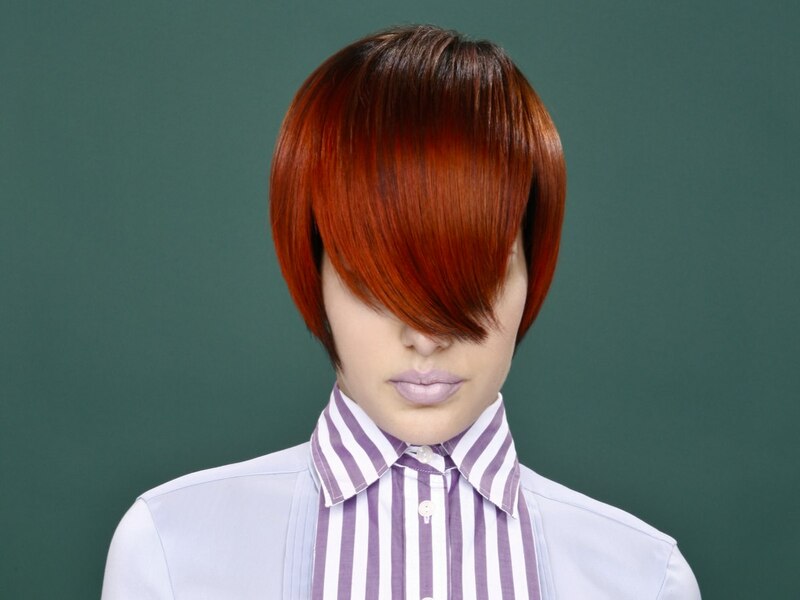 The red tones appear in their full color but also in darker shadings which gives the surface of the hair so much depth and a marbled appearance. 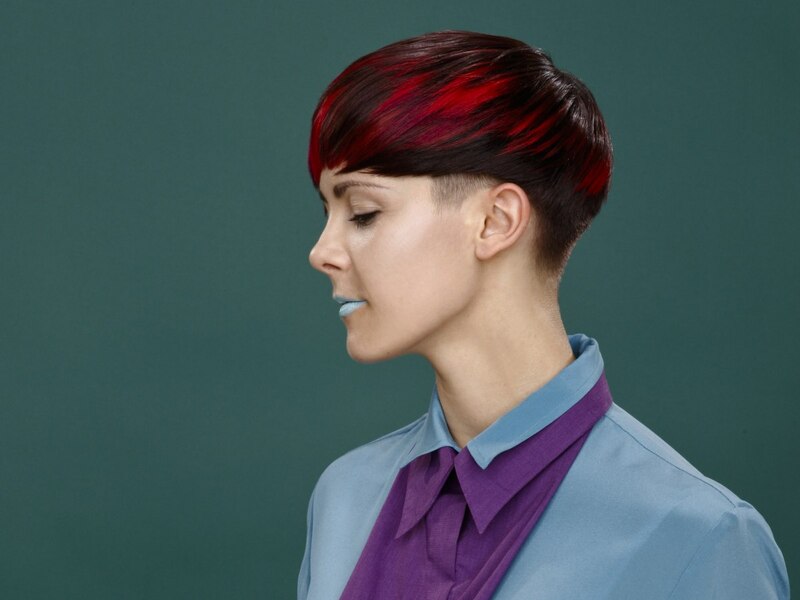 Forward styling that reveals the darling little undercut on the side. 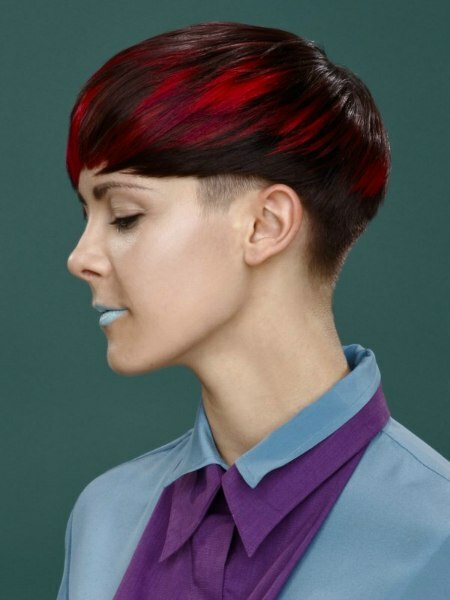 Geometric sleekness and flexible styling make this one of the sharpest hairstyles to have. A light resemblance to Manga drawings makes this look so appealing especially for young women. 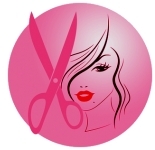 Based on a short bob, the sides were cut at different lengths and one of them features a large triangular shape between ears and cheekbone, while the other side covers the ear. The fringe is straight, but it can be styled slightly pushed to the side. Her color is a deep black/brown with extreme shine. 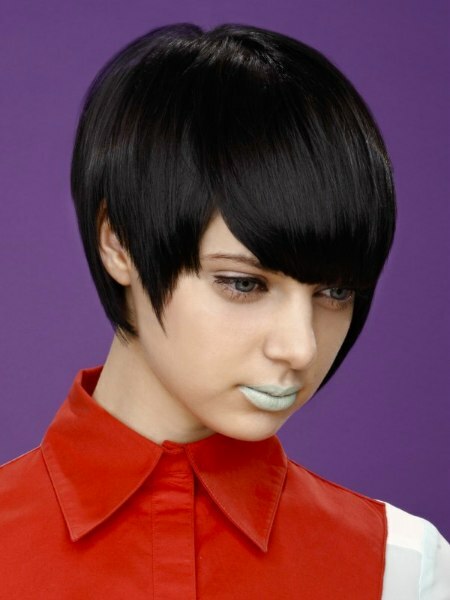 Light blue lipstick is an uplifting combination to this classic with an edge. Who needs to see clearly when we can have some great bangs that are just bigger than life. The veil of copper is not very thick however and she will be able to navigate her way around while displaying her avant garde sense of style. The longest point of the fringe is just a smidgeon to the side of her nose and from there the shape widens to a petal shape and reaches way back on her head. Sides are demure and graphical and all of it is dipped into the brightest and richest copper that can be found. A cool lavender in outfit and lipstick is exactly opposite on the paint spectrum and yet a fine combination. 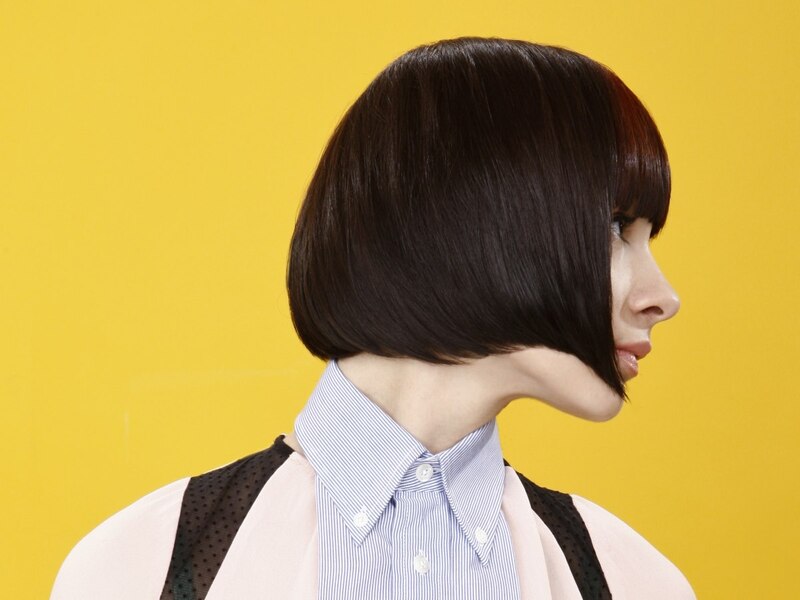 Varying lengths give this bob its pizzazz. 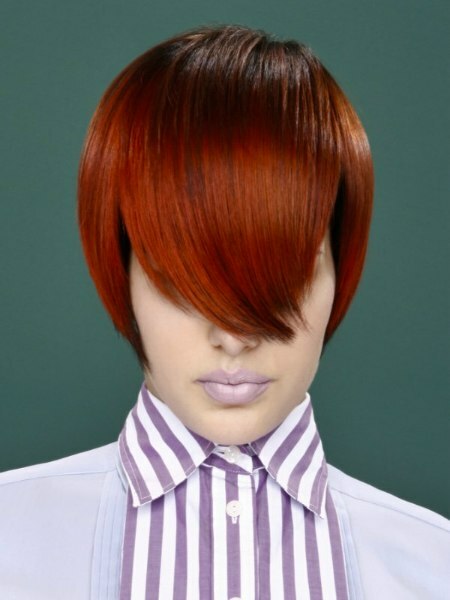 Almost invisible is the texture when the hair is styled forward. A top layer is textured so much that the shorter and straight cutting line is strong, yet with a fine feathering coming down below it. Another stylish touch is a slight difference in color of the fringe, which is just a little bit lighter than the rest due to brown highlights on the dark base color. You don't need to follow the white rabbit down his hole to dress up in your own fantasy look. Hair is flexible and can be whatever we dream it to be. 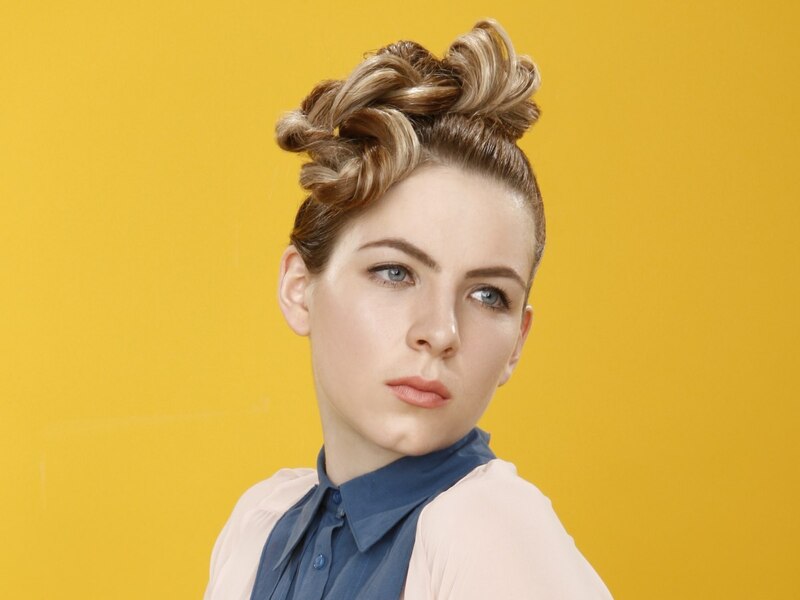 Mič Styling did some dreaming for us and this hairstyle is a good example of where creativity can take a high ponytail. The light and dark shades of blonde form long streaks which intensify the effect of the swirls and curls that are draped over her crown. The ponytail has a very high base and the hair was twisted, then gently directed to this shape. This is not your typical braided peasant style look. The fine braids were done with high skill and even more artistic talent. Shaped into swirls the hair was braided French style with adding a new strand at every other weaving. The front runs in a diagonal line across her forehead and turns into a large snail shape that covers her ear. Another spiral comes in from the other side and the resulting asymmetry is extravagant in texture and luxurious with the champagne blonde color. A small chignon is the center from where the swirling, interlacing small braids originate that create this intricate pattern on the back of her head. 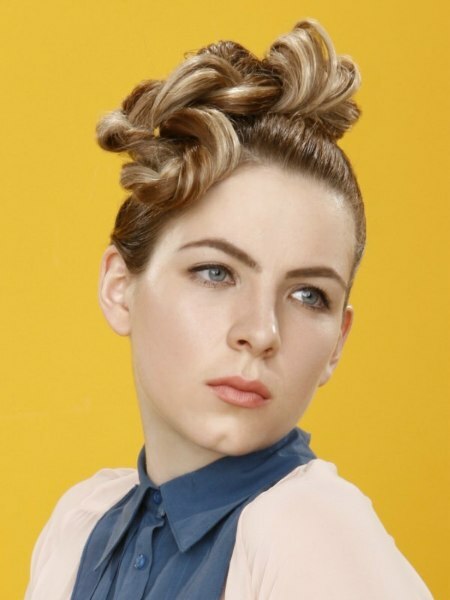 What a great way to bring artistic flair to a simple hairstyle. Elegance and whimsy get along just fine and the best news of all is that this look can be recreated even if your hair is not long enough to create these braids. You can buy them in any good beauty supply store and even try a contrasting hair color. Just bundle them and pin them into the chignon of your own hair and play with the shapes! Mixing styles can span centuries and look brand new and ingenious. 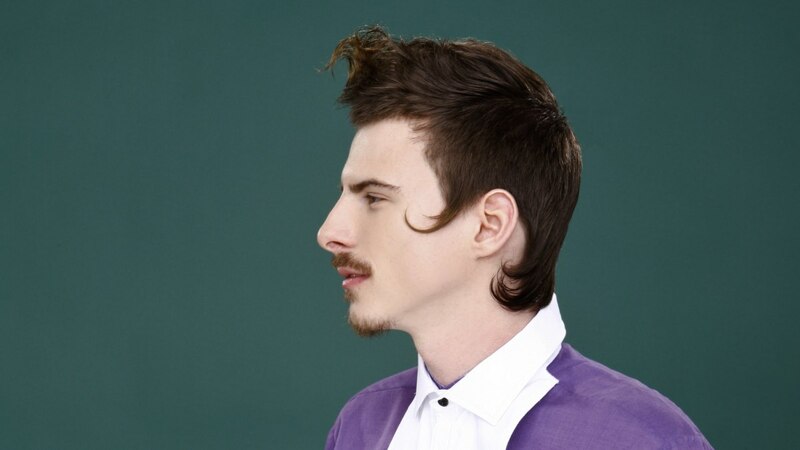 A modern short men's haircut was connected back to his great great grandfathers style with a charming curl on the side of the face and in the neck. A mustache and small chin goatee are a must-have with this. The top is adorned by a most adorable little pompadour, also curled and supported by textured layers of very short hair.